Activities in the Area are to be organized, carried out, and controlled by the Sea-Bed Authority. The Authority is to conduct its undertaking in such a manner as to foster healthy development of world economy and balanced growth of international trade and to promote both just and stable prices remunerative to producers and fair to consumers as well as a long-term equilibrium between supply and demand. These goals are inherent in the provisions on production policy as well, and are the logical and consistent development of the overriding principle that the Area and its resources are to be developed for the benefit of mankind as a whole. 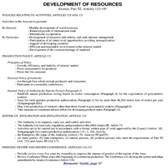 Further policies to be followed are inter alia (a) responsible conduct in the Area and on the world mineral markets, (b) acquisition and transfer of technology, (c) raising and use of all kinds of revenues from activities in the Area, (d) enhancement of opportunities for activities for all states, and (e) taking at each step the interests and needs of particular states or particular groups of states into consideration. 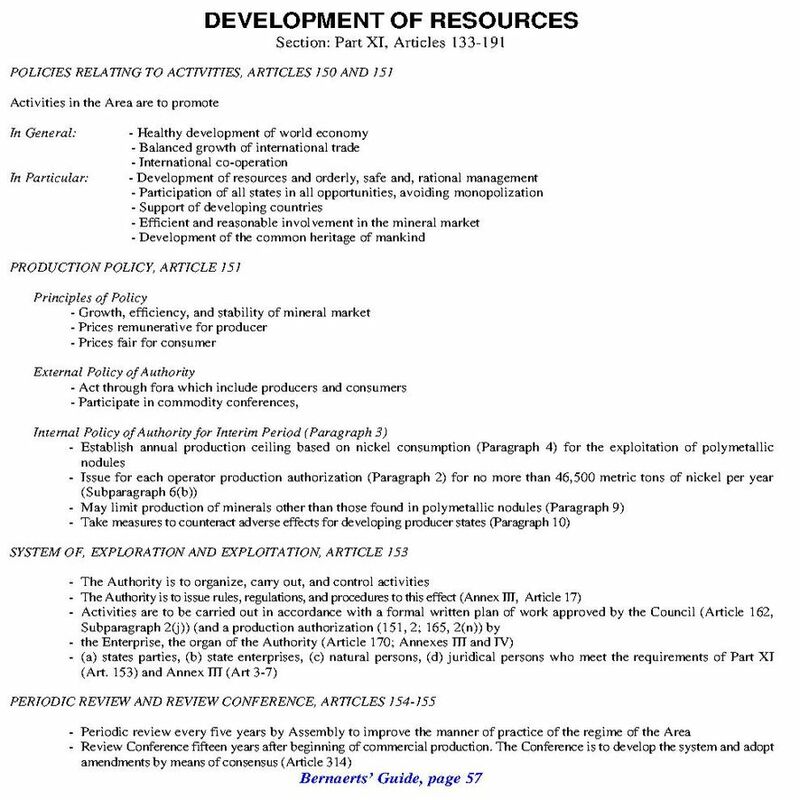 These general policy aims are to be accepted and supported by all states, their nationals, and the Enterprise when conducting activities in the Area under the organization and control of the Authority, and are regulated in particular in Annexes III (Basic Conditions of Prospecting, Exploration, and Exploitation) and IV (Statute of the Enterprise). For an interim period of up to twenty-five years (beginning five years before first commercial production), the Authority must adhere to a detailed production policy for polymetallic nodules, which is to be calculated on the basis of the projected world nickel consumption. Production authorizations for operators are also to be issued in accordance with these projections. The Authority has further the power to limit the production of minerals other than those in polymetallic nodules and may implement compensation schemes or take economic measures for developing countries which might suffer adverse effects as a result of the production policy issued. The performance of the Authority is to be reviewed by the Assembly at intervals of five years with the aim of improving the practice of the deep-sea mining regime. In addition, the Assembly is to convene a Review Conference fifteen years after commercial production commences. In summary, it can be said that the duties entrusted to the Authority go beyond those of simple administrative nature. The Authority is to take any measures necessary to promote the growth, efficiency, and stability of markets of commodities produced from minerals derived from the Area and can enforce such policies by means of the right to participate in any commodity conference and the right to become a party to any arrangement or agreement resulting from such a conference. The Authority's duties and rights are intended to enable management with political effect, but it must avoid discrimination in the exercise of its power and functions and monopolization of activities in the Area.